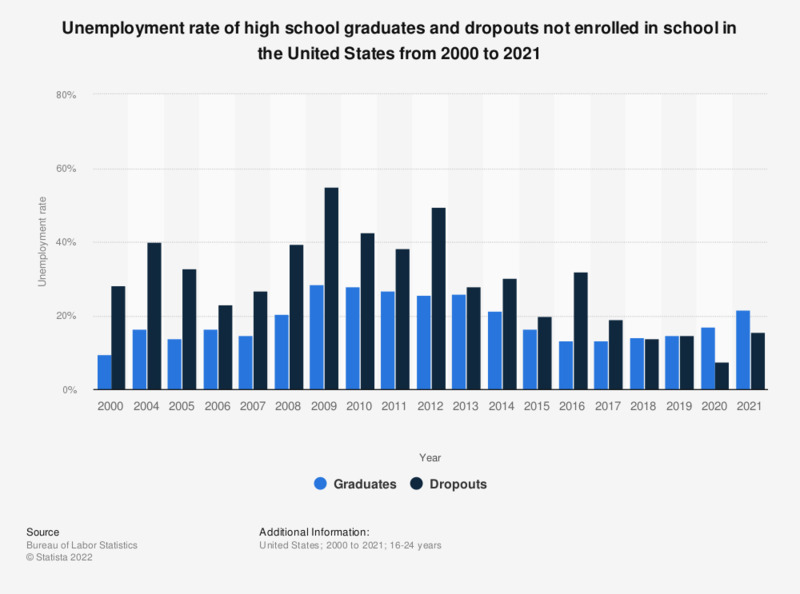 This graph shows the unemployment rate of high school graduates and dropouts not enrolled in school from 2000 to 2017. In 2017, around 18.9 percent of high school dropouts were unemployed, compared to 16.8 percent of graduates. See the United States unemployment rate and the monthly unemployment rate for further information. As seen from the timeline above, high school graduates are generally employed at a much higher rate than individuals who had dropped out of high school. Since 2000, the share of high school dropouts to be employed has risen and fallen. Unemployment of high school dropouts reached a low in 2017 at 18.9 percent almost matching that of graduates. In 2016, 89.1 percent of the U.S. population who were aged 25 and above had graduated from high school. Unemployment of high school dropouts is also much higher than the national unemployment rate in the United States. As of 2016, unemployment in the U.S. was at 4.9 percent, down from a high of 9.6 percent unemployment in 2010, the highest yearly rate in ten years. Nationwide, unemployment is worst among farming, fishing, and forestry occupations, with a rate of 8.9 percent in April 2017, followed by construction and extraction occupations and transportation and material moving occupations. Not only were almost 32 percent of high school dropouts unemployed in 2016, but working high school dropouts earned less on average than individuals of any other level of educational attainment. In 2015, mean earnings of individuals who had not graduated from high school were about 35,551 U.S. dollars annually, compared to 43,061 dollars among high school graduates and 76,310 dollars among those with a Bachelor's degree. Graduates refer to persons who graduated from high school in January through October of the respective year. Dropouts are persons who who dropped out of school in the ongoing school year which starts and ends in October. Data from previous years has been taken from respective releases which can be found here. Which of the following purchases are you going to do for your graduation ceremony?